Rok Kranjc: Many of today’s proposals for and experiments with Universal Basic Income (UBI) in so-called developed countries seem to be congruent with, and indeed in some instances explicitly catered towards maintaining the dominant political economic architecture and status quo imaginary. Some of the more salient narratives regarding UBI present it as a silver bullet for all kinds of (neoliberally framed) social and economic woes and as a remedy for the pressing issue of automation which is assuredly having disruptive effects on the business-as-usual as practiced to-date. On the other hand, more radical proposals relevant to the UBI debate find themselves confined to academic and political ghettos, while those that do make it to experimental stage are watered down to versions of ‘basic income light’[i] through processes and barriers integral to incumbent political economic structures and forms of political deliberation. While such experiments and proposals may be crucial stepping stones in fostering social salience and political legitimacy around alternatives to dominant welfare and wage labour models, it is important to recognize their limitations, particular application contexts, scales and time-horizons, with reference to wider integrative visions and potential mechanisms of socio-economic and political transformation. However the reality is that at this time such wider and integrative visions are lacking, while radical and systemic alternatives to welfare remain severely undertheorized in crucial areas. In the following I outline three critical areas that in my opinion can further the UBI debate, guided by the overarching question of what might an open ended, ecologically sound and socially just welfare system and pathway towards it look like. Imagining potential futures of welfare from a ‘long now’[ii] perspective necessitates the recognition that some solutions should be designed to have intentionally short life-spans while others should be designed to change over long periods of time. [iii] The reality is that the forms of UBI thus far explored are likely not the be-all and end-all of alternatives. It is thus important to consider the view that UBI models based on fiat money pooled and distributed by means of more or less conventional market and state mechanisms (e.g. taxes, redistribution of state funds) may be an an overall important, yet perhaps best seen as consciously interim step in institutional re-design and citizen emancipation and empowerment. It is relevant to note however that UBI models, defined as unconditional payments of certain sums of money to individuals of a society, already today find rivals, for example in the concepts of Universal Basic Assets (UBA)[iv] and Universal Basic Services (UBS)[v], which importantly shift the debate from income to access to and participation in the commons. Using the ‘city as a commons’ framework and the critical concepts of UBA and UBS as starting points, it is possible to conceive of commons-based welfare models that operate on the principles of universal rights and effective access to basic and potentially expanding asset and service options (e.g. housing, food, energy, healthcare, mobility, internet, education, sport, recreation) and the care, co-creation of and democratic deliberation about them using novel collaborative, open-source, circular, sharing and regenerative economy approaches, among others. The currently ongoing and planned UBI experiments in the Netherlands, once presented as a beacon of hope in mainstream media, have recently been subject to a number of relevant critiques. It is important to outline that these experiments are not of universal income as they specifically target the unemployed and those already receiving some form of social benefit; nor are they unconditional, but configured with mind to supporting existing ‘labour market integration’ policies and mechanisms. Today, it is crucial to expand our definition of work and to rethink our engagement with it, a discussion that should go well beyond the reductionism of the automation narrative as presented in the mainstream. What is thus needed are systems complimentary to UBI/UBA/UBS that open up and encourage access to skills, (co-production of) knowledge, and discovering and trying oneself out at various (sometimes not so at once apparent) forms of social and ecological service and ‘life callings’ in transitional times; as well as civic media infrastructures that can support proactive public discourse and balance the challenges of sustainability and equitable and resilient welfare provisioning with voluntary contributions to the collective resource and work/service pool, individual capabilities, personal and communal lifestyle preferences, and translocal solidarity agreements. An interesting idea in this regard is the ‘balanced job complex’,[ix] proposed by Michael Albert and Robin Hahnel in their model for participatory economics; a deliberative democratic model that may be found useful in conceptualizing dynamic ways of societal self-configuration of equitable and contributory work loads depending on needs and challenges. By imbuing the UBI debate with a more systems-oriented and commons perspective, I have argued that an important shift is made from income and work as such to deeper interrelated questions of 1.) rights, capabilities and effective access; 2.) forms of deliberation, governance, entrepreneurship, collective care and accounting; 3.) forms and scales of pooling resources and work, and; 4.) forms and scales of equitable distribution and sustainable and resilient provisioning of universal basic commons entitlements. The perspective illuminates the contingent relationship between the contextual and subjective ‘political viability‘ of the UBI, and the scopes and salience of articulated (critical, open-source, open-ended) alternative institutional possibilities; and the prospects of a polity that exploits a dialectical relationship between interim or hybrid institutional models on the one hand, and radical experimentation with other socioeconomic configurations, emergent city-making/place-making cultures and political possibilities in the here-and-now on the other. [ii] Brand, Stewart. 1999. The Clock of the Long Now: Time and Responsibility. New York: Basic Books. [iii] Irwin et al. 2016. Transition Design: A Proposal for a New Area of Design Practice, Study, and Research. Design and Culture, 7(2), 229–246. [vi] Bauwens, Michel. 2006. Complementary Currencies and the Basic Income. Available at: https://blog.p2pfoundation.net/complementary-currencies-and-the-basic-income/2006/02/14; Bauwens, M. & Niaros, V. (2017). Value in the Commons Economy: Developments in Open and Contributory Value Accounting. Chiang Mai: Heinrich Böll Stiftung & P2P Foundation. 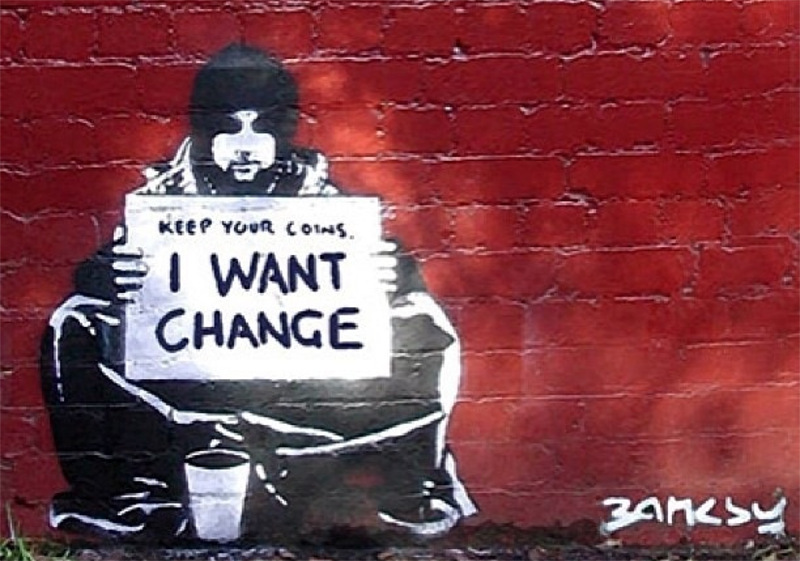 Lead image:Graffiti work by Banksy, itself a reworking of the original “Begging for Change” by Australian street artist Meek. The LABoratory for the GOVernance of the City as a Commons (“LabGov“) is a place of experimentation in all respects. However, instead of alembics and tubes you can find students, scholars, experts, activists thinking and discussing about the future shapes that social, economic and legal institutions of the city may take. Find out more here.